We offer owners the peace of mind while they enjoy their waterfront properties. 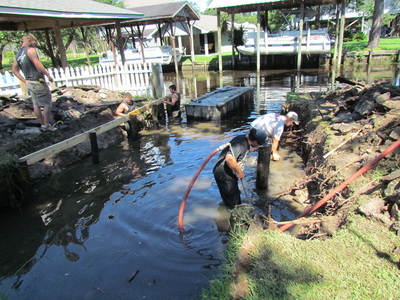 Our professionals examine your pilings and docks to ensure they are functional and built to last. We can rebuild or repair your docks and pilings. We install, repair and rebuild bulkheads and seawalls to strengthen them for years of protection and stability with our Patent Pending system. They were built to protect your property, but bulk heads require maintenance to ensure protection continues. Continue to enjoy your waterfront property with our dock/deck construction and repair services. In addition to new docks and deck restorations, we offer maintenance and cleaning services. Our free inspection will identify any plant and/or marine animal damage to the structures and we also check the hardware for rust and corrosion damage. For professionals you can trust to work with you during every step of the project, call Deep South Dock and Piling at (985) 774-5788. Stop time, plants and animals from ruining your investment. Maintenance is essential to ensuring your property withstands the test of time. Stop bugs, worms and plants from destroying your property. At some point, you will have to deal with the beautiful nature you enjoy trying to take over your property. We work hard to stop marine life from taking over your property. Our experienced professionals will work to stop the damage caused by nature and time. From protecting your property against everything from wood boring worms, shipworms and gribbles to plants that wrap themselves around your docks and decks, Deep South Dock and Piling Restoration® can offer photo evidence of jobs well done to give you peace of mind in hiring our services. We are just a short drive from areas all along the Gulf Coast. Years of experience and dedication to rebuilding. We are ready to provide quality service and workmanship. Local to cities including New Orleans, Slidell, Mandeville, Covington, Madisonville, Pearl River, Grand Isle, Venice, Port Fourchon, Manchac, Baton Rouge, Morgan City, Delacroix, Houma, Myrtle Grove, Chalmette, New Iberia, Springfield, Lake Ponchartrain, Calcasieu Lake, Atchafalaya Basin, Metairie, Lake Charles, Kenner, Monroe, Marrero, Laplace, Bayou Cane, Thibodaux, Belle Chasse, Bayou Blue, Luling, Moss Bluff, Bogalusa, Destrehan, Gonzales, Raceland, Jennings, Denham Springs, St. Rose, Westwego, Carencro, Breaux Bridge, Lacombe, Galliano, Bridge City, Eden Isle, Ponchatoula, Meraux, Violet, Marksville, Port Allen, Cut Off, Bayou Vista, New Roads, Lake Providence, Lake Arthur, Boutte, Abita Springs, Golden Meadow, Port Sulphur, Buras, Lakeview, Dulac, Empire, Paradis, Boothville, Natchez, and all other cities and towns throughout Louisiana. Local to cities including Bay St. Louis, Gulfport, Waveland, Biloxi, Pass Christian, Diamondhead, De Lisle, D'Iberville, Moss Point, Gautier, Jackson, Southaven, Hattiesburg, Vicksburg, Meridian, Tupelo, Greenville, Olive Branch, Horn Lake, Clinton, Pearl, Madison, Ridgeland, Starkville, Columbus, Pascagoula, Brandon, Ocean Springs, Natchez, Long Beach, McComb, Brookhaven, Picayune, and all other cities and towns in Mississippi. Gulf Shores, Bayou La Batre, Dauphin Island, Theodore, Tillmans Corner, Mobile, Spanish Fort, Fairhope, Daphne, Point Clear, Magnolia Springs, Fort Morgan, Oyster Bay, Orange Beach, Perdido Beach, Perdido Key, and all the coastal towns, cities and waterways in Alabama. Pensacola, Pensacola Beach, Destin, Miramar Beach, Panama City Beach, Navarre Beach, Santa Rosa Beach, Laguna Beach, Rosemary Beach, and waterfront properties across the Florida panhandle.